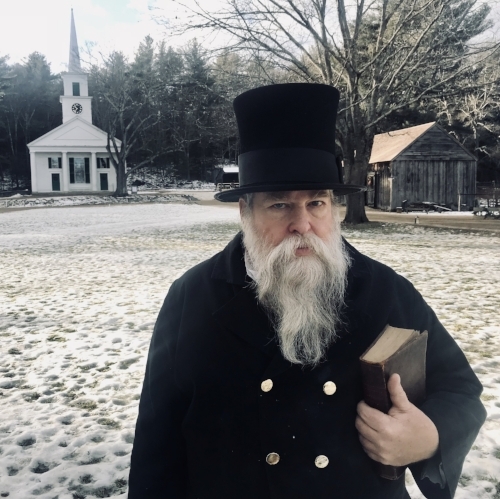 MIDWINTER MISCHIEF ran in February 2017 and January/February 2018 at Old Sturbridge Village in Sturbridge, Massachusetts. 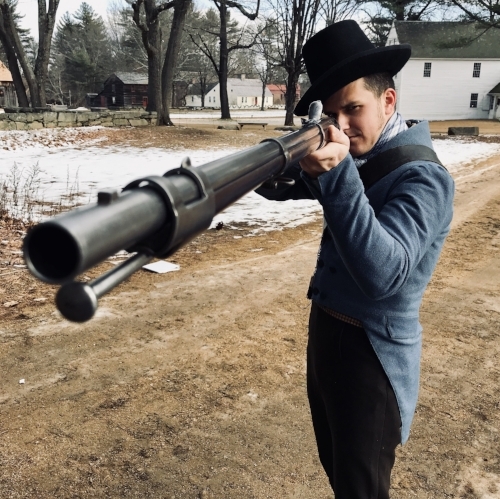 MIDWINTER MISCHIEF is a fable told as a two-hour theatrical adventure that follows a wily Yankee Peddler as he barters his way through the village, having spent all of his earnings at Bullard Tavern the night before. After being confronted over his debt, The Peddler asks to fill his cup with ashes from the tavern’s hearth, promising Mr. Bullard (the tavern owner) that he will “return with a cup overflowing with gold” and heads out into the village. The audience is sent from the warmth of the tavern out into the cold in pursuit of The Peddler, challenged by the town constable to gather enough evidence to convict him. They meet the various residents of the town who tell stories of what The Peddler has done and where he was going. Each audience member is given the identity of a character who could have passed through Bullard Tavern in the 1830’s with biographical information which will be used later in the experience as they are called upon to perform certain tasks in The Peddler’s wake. Upon finding the now-infamous rake at the end of their journey, the audience is invited back to the tavern for a meal and a dance by the fire. Over the course of the two hour adventure through the village, the audience has the opportunity to participate in many activities and meet many characters from the era. They will throw clay with an overwhelmed potter, saw wood with an overly-optimistic farmer, stuff a sausage with his knowledgeable wife, dip tallow candles with the the printer’s family while being with regaled with The Peddler’s tall tales, get lectured by frustrated preacher while sipping hot chocolate prepared by his wife, witness the making of an oxen shoe by the blacksmith and sit down for an arithmetic lesson with an schoolteacher. The audience finally encounters the mischievous Peddler as his schemes to pay off his debt unfold. The adventure ends with a tavern party where everyone compares notes on their journey, connecting with their neighbors as they warm up by the fire over food, drink and live music. MIDWINTER MISCHIEF was written, directed and designed by P.J. Griffith, for which he received the 2018 International Museum Theater Alliance Joe Lipsky Award for Excellence in Playwriting.